Now for our sexiest topic yet! Alternatives to traditional toileting! If you find that you or your loved one need additional assistance with toileting beyond the options discussed in our Safety and Independence in the Bathroom blog, explore the options below. Oftentimes aiming into the toilet can become an issue for gentlemen with advancing dementia and/or low vision. Below are three options for increasing aim accuracy and decreasing time spent cleaning up! Adding an inexpensive, highly-visible target inside the toilet helps the gentleman see where they should be aiming. Increasing contrast between the toilet seat and toilet bowl is a useful trick. 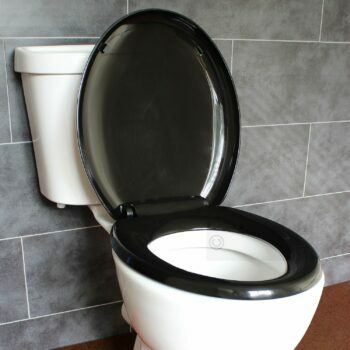 One option is to swap out your existing toilet seat for one in a contrasting color like the one in the image below of a white toilet with a black toilet seat. 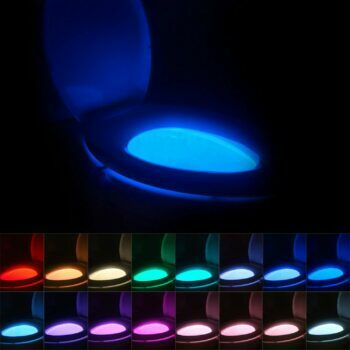 A second option is to add a motion-sensing nightlight that illuminates the inside of the toilet bowl in a contrasting color. Such as the one pictured below which is available from Amazon here. Wiping aids can extend a person’s reach, enabling someone with limited reach or range-of-motion to perform this hygienic task more easily and independently. There are several manufacturers of wiping aids, below are just two of the many options available. Long-handled tongs are the simplest style available. The user picks up the toilet paper or wipe with the tongs then uses the tongs to wipe. The Bottom Buddy toilet paper aid grasps the toilet paper with its rounded head. After the paper has been inserted, it covers the head and wiping can be performed. When finished, press the button on the handle to activate a rod that will push out the soiled paper. The French use them! The Japanese use them! You, as an American, can also use them! Trust me, we have one installed on our toilet and neither my husband nor I have died yet. Bidets can range in cost from $10-$1,000 depending on features and style. Check out Bidets 101 to learn more about different styles and considerations. A standard bidet attachment is installed beneath your existing toilet seat. The bidet sprays clean water at your nether regions for a hygienic cleansing experience. Bidet attachments are available with a range of features starting with a basic, cold-water only model. Most bidet attachments have a right-hand control panel however, some manufacturers also offer left-hand control panels. Installing a bidet toilet seat allows for more advanced options with such as this luxury unit which has water temperature control, a feminine cleansing option, heated seat, and slow-closing lid. Remote-controlled: Remote-controlled units can be a good option for someone with low vision who isn’t able to see a side-attached panel. The remote could also be mounted to the wall for a user to operate using their elbow or foot. When considering a bidet toilet seat, be sure to verify that its weight capacity is sufficient for the heaviest user. You will also need to know if you have a standard round or an elongated toilet. On the go? Portable bidets are available from numerous manufacturers for a minimal cost. Unable to use a traditional toilet? Below are several options for those who are unable to use a traditional toilet. 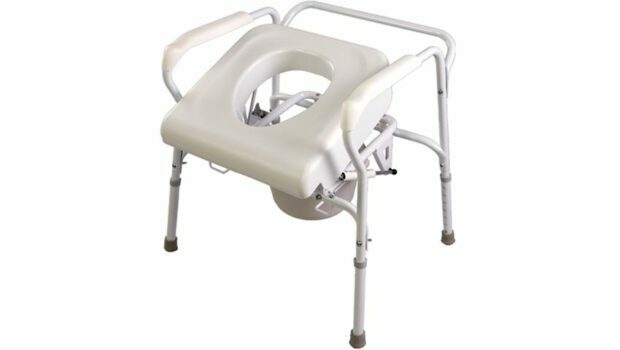 If lifting and lowering yourself onto the commode is difficult, consider the Uplift Commode Assist, a self-powered lifting commode that assists a user sit and raise themselves by providing 70% lift. For individuals who may not have the strength or mobility to transport themselves onto a commode, having a well-designed portable urinal is important. Portable urinals can range in price from $10 – $1,000. Featured below are a few affordable spill-proof urinals available in both men’s and women’s models. The Male SPIL-PRUF Urinal and the Female SPIL-PRUF Urinal have specially-designed spouts that prevent leakage once the urine is inside. Bedpans are a necessity for some individuals. This Vakly Extra Large Contour Bariatric Bedpan is a great option for adults, including bariatric individuals. Its tapered front helps to slide it easily under the user. Unable to afford these alternative devices?